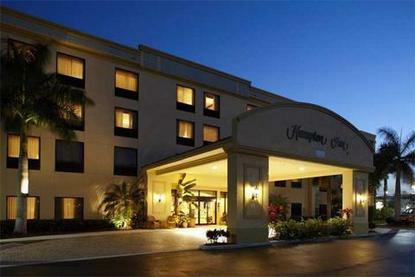 Award-Winning, very upscale Hampton Inn with a European influenced decor and much attention to detail emphasized from an attractive and charming lobby, to a beautiful tropical courtyard pool surrounded by Roman columns and statues. Most guestrooms are amenity-filled with features such as microwave, refrigerator, coffee maker and iron and ironing board. This stylish hotel also offers the convenience of meeting space, a sundries shop ,HSIA,and fitness center. Our hotel's location is ideally situated one block from Florida's turnpike, only four miles from I-95 and is adjacent to the renowned Emerald Dunes Golf Course. Restaurants and shopping are within walking distance to our location.